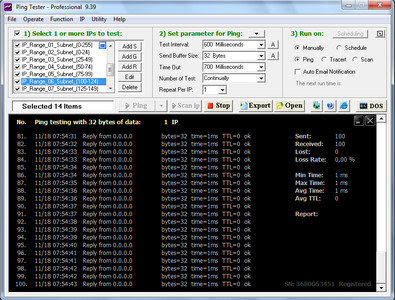 PingTester can store a list of IP addresses and network test commands to increase the working efficiency, perform ping and traceroute test by one click, 'ping sweep' subnets or interval ping all the hosts on a list continuously, save the individual ping records to a txt or Excel file, generate statistics reports which group by specified time interval, so that you can know the network connection status of each period. All dos commands can run in the Windows form. Features: 1. Ping or Trace Route a group of IP addresses. 2. Quick scan a group of IP. 3. Run all dos commands in the Windows form. 4. Automatically run the job at scheduled time. 5. Generate summary report for analyzing. 6. Export the test results to .txt or .csv / Excel file.